The Hotel Marlowe is one of my very favorite hotels. It is definitely the best Kimpton hotel in the chain. And here’s why—the staff is top notch. They are friendly, they are efficient, they are well trained, and they know their guests. Being greeted by name is great, especially when it is sincere and not read from a cue card. Every time I have had the pleasure of staying at the Marlowe I’ve had a great time. This trip was no exception. The staff was excellent, and the concierge Keith Dowsing left a welcoming gift of red wine and chocolates in my room. Sadly, I didn’t have a chance to drink the wine and I had no luggage to check, so I abandoned the bottle in the room. The chocolates were good though. 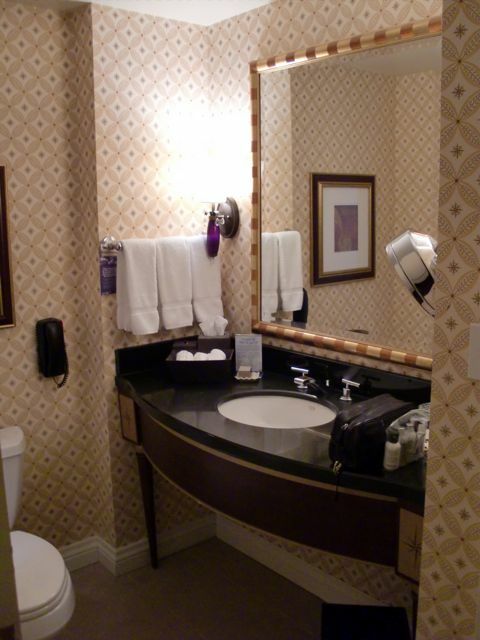 The Marlowe staff is so good that I overlook the fairly standard rooms on the property which have plussed up generic bathrooms. No plastic in sight, but the usual hotel bathroom design spiced up with decent wallpaper and nice fabrics remains generic. And then a shot of the shower through the mirror. 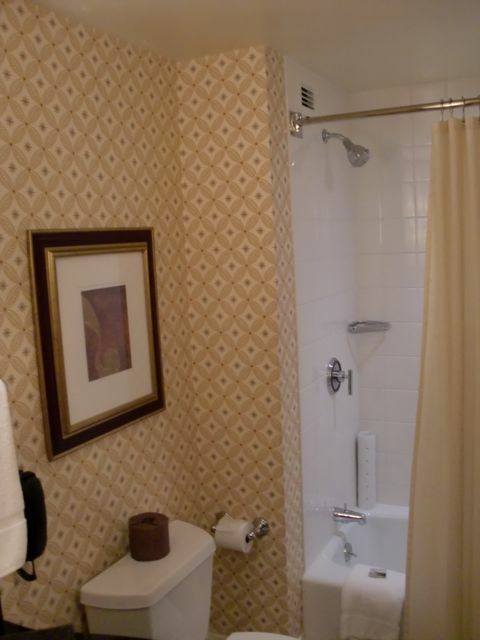 The shower even has one of those curve out shower curtain rods. We’ll pretend it doesn’t. Anyway, the Hotel Marlowe earns a coveted five showerheads rating in spite of their generic showers all because their staff is the best in the business. I always stay at the Hotel Marlowe when business brings me to Boston, and I have no reason to switch.